Life Insurance Corporation of India has issued a AAO Posts Recruitment Notification and the LIC invites Online Applications for appointment to the following posts of Assistant Administrative Officer (Generalist/ Chartered Accountant). Life Insurance Corporation of India, LIC has released the notification for recruitment of 590 Assistant Administrative Officers. The online application process for the said recruitment commenced on March 2, 2019. Interested candidates can apply online on licindia.in before March 22, 2019. 21 to 30 year old Graduates satisfying the eligibility criteria can apply for the posts. The age would be calculated as on March 1, 2019. Also, no offline forms would be accepted. Candidates are recommended to fill the online application forms by end of day on March 22. The last date for fee payment is also March 22, 2019. As for the salary, an LIC AAO would be entitles to a basic pay of Rs. 32795/- per month in the scale of Rs. 32795- 1610(14) –55335– 1745(4) –62315 and other admissible allowances as per rules. Overall, the salary would be roughly about Rs. 56,000 in Class A cities. Also, for the post of Assistant Administrative Officer (Chartered Accountant), candidates with two years post qualification work experience on the date of eligibility are eligible for two advance increments. Candidates interested are advised to carefully go through the eligibility, vacancy details and other important instructions before filling the online application form. The selection would be done on the basis of the performance in the preliminary and the main examination, followed by an interview. Preliminary examination is tentatively scheduled for May 4 and 5. The main examination is scheduled for June 28, 2019. The last day to apply for Life Insurance Corporation (LIC) Assistant Administrative Officers (Generalist/ IT/ Chartered Accountant/ Actuarial/ Rajbhasha) AAO exam 2019 is March 22. The application process or (Online Registration of Applications and Online Payment of Application Fee/ Intimation Charges) began on March 2, 2019. The total number of vacancies to be filled through this exam is 590. Out of the 590 positions available in the LIC AAO recruitment, 350 are reserved for AAO Generalist, 150 are reserved for AAO IT, 50 for AAO CA, 30 for AAO (Actuarial) and 5 for AAO (Rajbhasha). The total number of vacancies and the reserved vacancies is provisional and may vary according to the actual requirements. The minimum qualification required for different AAO positions is different and should be checked in the notification. Candidates must be at least 21 years of age (as on March 1, 2019), but not more than 30 years old (candidates must have been born not earlier than 02.03.1989 and not later than 01.03.1998 both days inclusive only are eligible ). There is relaxations in upper age limit for Scheduled Caste (SC)/Scheduled Tribe(ST)/Other Backward Community(OBC)/ Emergency Commissioned Officers (ECO) /Short Service Commissioned Officers (SSCO) /Persons with Benchmark Disabilities (PwBD) /Confirmed LIC employees. The application fee for the LIC AAO positions is Rs 600 plus transaction charges for all candidates other than SC/ST/ PwBD. For SC/ST/ PwBD candidates the fees is Rs 100 and transaction charges. Link to apply online for LIC AAO exam: The application can be made in online mode only through link available on LIC’s official website. 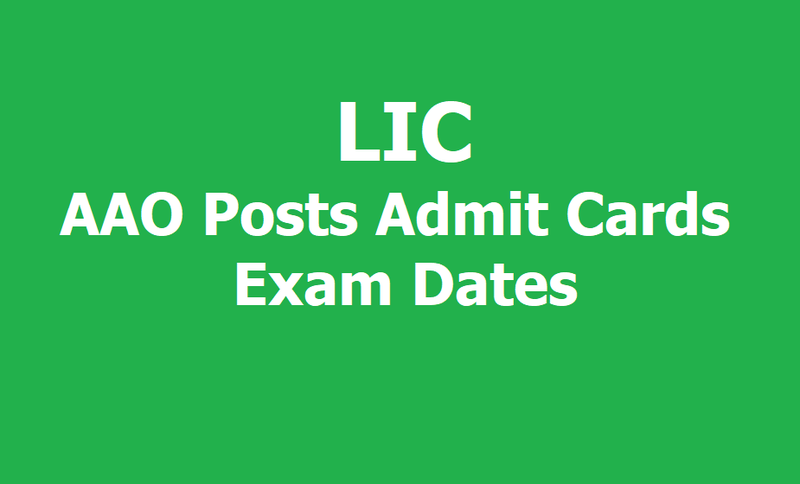 The exam for LIC AAO recruitment is tentatively scheduled for May 4th and 5th; call letters for the exam will be made available from April 22 to April 30, 2019.